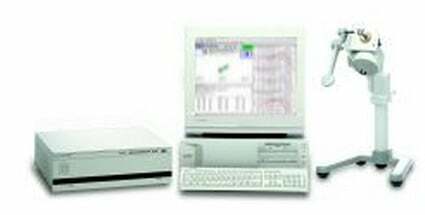 Microtronix' IP-II Phone Test System provides VoIP telephone manufacturers and designers with a method for evaluating the acoustic properties of their voice over packet telephones. The IP-II Phone Test System is the next generation IP phone test equipment from Microtronix. Utilizing DSP techniques and a new Test Console, the IP-II Phone Test System provides expanded capabilities such as Multitone Frequency Response and Audio File Play and Record. Using its acoustic interface, the system can measure how well a terminal acoustically reproduces audio signals received from the LAN and how well a terminal encodes acoustic signals captured by its microphones. It can do this for handset or handsfree phones. The IP-II Phone Test System can measure the latency (the amount of time the phone requires to encode and decode audio). The system can also measure other audio signals the terminal may send to the network, like DTMF. A pre-programmed VoIP test suite includes tests required by the TIA/EIA-810-A/B, TIA-920 and TIA-920-A standard. The IP-II Phone Test System creates a closed network to isolate VoIP phones from the effects of gateways and network variations. The system calibration software works in the digital domain to bridge the gap between the acoustic world and VoIP audio packets. This means that you get high speed, accurate, and repeatable standards-compliant acoustic information about your VoIP telephone. The available protocols for this system are H.323, SIP, and SIP wideband. The Controller Unit combines a Pentium class Windows computer platform with the Microtronix Real Time Controller Board. The new Test Console application integrates test results, frequency response graphs and a pass/fail visual indication of each test's status. The optional Summary Collector software saves full reports for each telephone on local or network disk drives. The IP-II Phone Test System is completely programmable. Pre-written TIA/EIA-810-A, ANSI/TIA-810-B, TIA-920 and TIA-920-A Handset and Handsfree test programs are available. The Test Program Development Kit provides everything you need to edit the Microtronix Test Programs or create your own. The Test Program Editor simplifies programming by organizing your test program into easily managed functional blocks. Several sample programs are included in the kit to get you started.